With the holidays just around the corner, anyone hosting a party stresses over that familiar dilemma: What should I make for dessert? You want to make something different and impress everyone at the end of the meal. But keeping the guests in mind and making something that appeals to everyone is key to successful entertaining. Tell your aunt to forget about bringing the same old trifle to your holiday gathering and opt for something you know friends and family will be raving about till next year: a perfect homemade pie. I joined Allison Kave, founder of First Prize Pies, at an afternoon demo, where she shared helpful tips and techniques for baking pies. 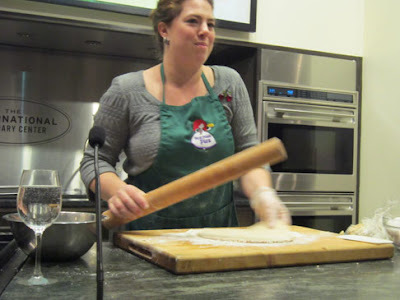 She featured three of her specialties: apple cranberry, Shaker lemon, and spicy hot chocolate. The concept is updating a classic comfort treat with modern flair and whimsical combinations of flavors. As soon as she mentioned her Root Beer Float Pie, I practically had one foot out the door, ready to place my order. The spicy hot chocolate was incredible! 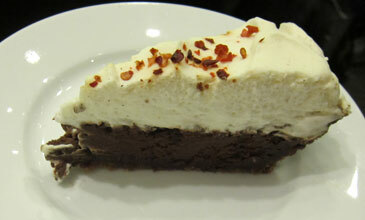 The chocolate filling had just the right amount of heat and was topped with whipped cream, sprinkled with red pepper flakes, and held together by a gingersnap cookie crust. Allison demonstrated her secrets to the perfect pie crust (she always makes her dough on a flat surface in order to have room to spread everything out and mix evenly). 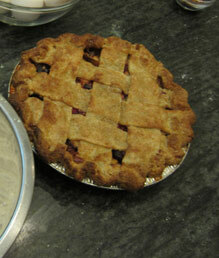 She made lattice-cuts and crimped edges look like a breeze. She finds that using European-style butter, which is higher in butterfat, results in a richer flavor. And instead of buying buttermilk, she makes her own simply by adding apple cider vinegar to some whole milk. Those who use buttermilk in any recipe know how annoying it is to buy a whole container and have so much leftover after using just a small amount. Allison won the Best Overall Prize in 2009 at the Brooklyn Pie Bake-Off. Encouraged by her boyfriend to enter the contest, Allison stuck with a personal favorite, her Bourbon Ginger Pecan Pie, something she has been baking since she was fifteen. Though she admitted to a bit of hesitancy about entering and feeling as though she had no chance of winning, she surprised herself and certainly delighted others with her delicious contest entry. I always enjoy hearing personal stories about how one starts a small business, often from turning a hobby into a new career. Allison’s story was one I could especially relate to, as she told her personal journey of re-thinking what she really wanted to do during the economic crisis. The day of the contest was meaningful, as she shared her success with family and friends who came out to support her. What makes her work so enjoyable, Allison said, is that there is something about pie that always fosters a sense of community. First Prize Pies are a great solution to a holiday party, or any event, when you want an actual homemade dessert and don’t have the time to make one. All you have to do is decide which one (or two) you want, and order! Alexa Magarian is a student in the Classic Pastry Arts program. Originally from Boston, she hopes to combine her background in public relations and writing with her love for cooking and baking. Her greatest joy in life is spending time with her family around the kitchen table, eating dinner together. When she is not tempering chocolate and creating desserts in class, she enjoys traveling for inspiration, and meeting people who are just as passionate about food as she is.